High Definition eXperience (HDX) is a set of technologies that provides a near to HD local like experience of a remoted virtual app, desktop or both to users anywhere in the world on any device even without installing anything on that device all you need is a modern widely used (supported) HTML5 compliant internet browser e.g Chrome, Safari (try it on your iOS devices :-)), Firefox, Internet Explorer you get the picture. HDX is simple yet so powerful and has three founding principles which are intelligent redirection, adaptive compression, and data de-duplication like wise it has three principles it performs when you connect to there virtual resources which is Inspect the VM (Server vs. Desktop) what does it have e.g vGPU, Inspect the network what its like and can I use UDP for adaptive transport or should I fallback to TCP to remote the display + multimedia and finally it inspects the end-point what is there and can I use it? An example is the HDX Optimisation Pack available to offload audio/video for my Skype for Business sessions or shall I utilise generic HDX fallbacks? https://www.citrix.com/content/dam/citrix/en_us/documents/white-paper/citrix-hdx-technologies.pdf. Also be sure to check out the HDX resources page on Citrix.com at – https://www.citrix.co.uk/products/xenapp-xendesktop/hdx-technologies.html. Finally you can find all the latest about XAD 7.16 and not just whats new with HDX in this release at – https://docs.citrix.com/en-us/xenapp-and-xendesktop/current-release/whats-new.html and you’ll notice that it’s not a 7.16 URL but refers to current release or CR. Skype for Business to Teams “We are committed…” read all about it in Dereks blog post on Citrix.com – https://www.citrix.com/blogs/2017/11/08/the-big-news-about-microsoft-teams. The big announcement is that HDX RealTime Optimisation Pack now has an LTSR release version 2.4 which is available and you can learn more product lifecycle information at – https://docs.citrix.com/en-us/hdx-optimization/2-4-ltsr.html. Its also worth noting that this LTSR does NOT support any version of Microsofts Teams only Skype for Business 2015, 2016 you can learn more by reviewing the System Requirements for the client vs. server side at – https://docs.citrix.com/en-us/hdx-optimization/2-4-ltsr/system-requirements.html. – HDX RealTime Media Engine for the Citrix Ready workspace hub (formerly known as HDX Ready Pi) is only supported for ViewSonic – https://citrixready.citrix.com/viewsonic/viewsonic-sc-t25.html or NComputing – https://citrixready.citrix.com/ncomputing/ncomputing-rx-hdx-thin-client.html Pi’s only. You can also get management of these devices from Stratodesk check out – https://www.stratodesk.com/products/raspberry-pi-thin-client. – Behavioural changes in the way audio is handled in fallback mode when CPU is busy is to disable Echo Cancellation via the RTME as the generic HDX RealTime will handle this capability until returning to expected behaviour and lower CPU load. – Enhancements to the microphone to provide better insights into whom is speaking. The full list of what’s new in this LTSR is available at – https://docs.citrix.com/en-us/hdx-optimization/2-4-ltsr/whats-new.html. – The release of XAD 7.16 introduces a great new VDA installation behaviour change 🙂 whereby it will automatic set the HDX mode to be standard (Server OS) vs. HDX 3DPro mode (Desktop OS if it meets the requirements for HDX 3DPro e.g the Desktop OS includes a vGPU or GPU) which I believe is setup in the right direction and simplifying overall CTX Admin overhead e.g another syntax option to remember vs. I forget to configure the correct parameter. – Now by default the new HDX Graphics mode is enabled is adaptive transport or EDT and is set to Preferred. Don’t worry if your a Citrix Admin as you’ve maybe already realised I didn’t enable UDP for this to work! Remember is an adaptive remote display protocol so it will fallback to TCP by default using the default Citrix HDX ports. Its also worth mentioning that when (Preferred) is set then SR is enabled for both UDP vs. TCP connections and client connections (Receiver check supported versions e.g Win min 4.10; Mac 12.8) are attempted in parallel during the initial connection, for SR reconnections and finally auto client reconnects aswell. – Browser Content Redirection – https://docs.citrix.com/en-us/xenapp-and-xendesktop/current-release/multimedia/browser-content-redirection.html redirects the contents to the local device running an embedded browser within the HDX session which allows for offloading of content, network traffic, graphics from the VDA running in the resource location to the users end-point enhancing the UX significantly. – Not strictly something new but HTML5 Redirection – https://docs.citrix.com/en-us/xenapp-and-xendesktop/current-release/policies/reference/ica-policy-settings/multimedia-policy-settings.html which is still currently only available for internal usage as you’ll read from the eDocs article but this is 100% something an Citrix Admin & Architects should begin testing today as HTML5 begins in my personal view to supersede Flash based websites as we move forward towards 2020. – H.265 encoding support running on the latest end-points which supported a GPU that supports H.265 decoding and if its not available it will by default fall-back to H.264 decoding. The net result of moving to H.265 from H.264 which is a Platinum only feature results in significant bandwidth savings and much better UX. I have seen the net results with a few of our engineering customers that develop vehicles with teams spread out across the world and the results as awesome! – Strictly speaking this is not agnostic or exclusive to the HDX technology stack but the Windows Continuum is quiet important for a great user experience and its powered by primarily at a the hypervisor level and its currently only supported on Citrix XenServer. Visit – https://docs.citrix.com/en-us/xenapp-and-xendesktop/current-release/technical-overview/hdx.html for how-to configure it today if your running XenServer. – “Session Watermark” with custom text which you learn to setup and configure using the following CTX article – https://support.citrix.com/article/CTX230054 and was originally part of the XenApp Secure Browser and its deployment guide is available at – https://docs.citrix.com/content/dam/docs/en-us/workspace-cloud/downloads/Secure%20Browser%20-%20Deployment%20Guide.pdf. I be covering off some HDX topics in more detail in up and coming blog posts either here or in “Expert Insights” at myCUGC website at – https://www.mycugc.org/. Finally if you want to take part in my challenge for 2018 you can learn more about it at – https://www.mycugc.org/blog/a-2018-challenge-for-the-mycugc-community. This entry was posted in #myCUGC, Citrix, Citrix Technology Advocates, CTA, EDT, HDX, HDX 3D Pro, HDX Broadcast, HDX Realtime, Skype for Business, Skype4B, vGPU, Workspaces and tagged 7.16, Adaptive Transport, Citrix, CUGC, EDT, GPU, H.264, H.265, HDX, HDX 3D Pro, HDX Pi, HDX Pi Stratodesk, HDX RealTime Optimisation Pack, HDX technologies, https://www.mycugc.org/, myCUGC, NComputing RX-HDX, Skype for Business 2015, Skype for Business 2016, Skype4B, Stratodesk, vGPU, ViewSonic SC-T25, XenApp, XenApp 7.16, XenDesktop, XenDesktop 7.16 on February 1, 2018 by lyndonjonmartin. The following content is a brief and unofficial prerequisites guide to setup, configure and test delivering Skype for Business 2015 as a Citrix virtual app or an app within a virtual desktop powered by Citrix XenApp or XenDesktop prior to deploying in a PoC, Pilot or Production environment by the author of this entry. The views, opinions and concepts expressed are those by the author of this entry only and do not necessarily conform to industry descriptions or best practises. The following blog article provides a basic understanding of how to deploy Skype for Business 2015 with the HDX Optimisation Pack 2.0 within a Citrix XenApp, XenDesktop environment which offloads the audio and video to the users local end-point running Citrix Receiver and the HDX RealTime Media Engine on supported Windows, Mac or Linux OSes. 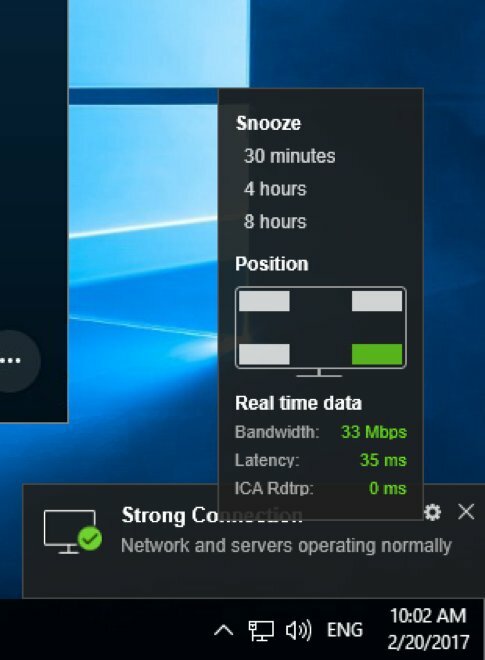 This offloading capability is powered by latest v2 HDX Optimisation Pack 2.0 architecture which can be found at – https://www.citrix.com/blogs/2016/01/12/citrix-and-microsoft-unveil-v2-solution-for-skype-for-business/ joint worked on between Citrix and Microsoft. The following is an oversimplified diagram which is also not intended to be 100% accurate but should provide you with a better understanding of the differences between an non-optimised vs. optimised delivery of a Skype4B virtual app from a Citrix environment. 1. You’ll require a Skype for Business 2015 server, Microsoft Skype for Business Online* or Microsoft Lync 2013 back-end server with the Skype for Business 2015 client. You you will also require one of the following supported operating systems (Desktops) Microsoft Windows 10, 8.1, 7 or (Servers) Microsoft Windows Server 2008 R2, Windows Server 2012 R2 and along with supported version of XenApp, XenDesktop which you can verify which versions are supported at – http://docs.citrix.com/en-us/hdx-optimization/2-0/hdx-realtime-optimization-pack-system-requirements.html. 3. Upgrade your Citrix Receiver and install the HDX RealTime Media Engine 2.x.n – http://www.citrix.com/downloads/citrix-receiver/additional-client-software/hdx-realtime-media-engine-201.html. You can now also download the latest Citrix Receiver 4.4 and HDX RealTime Media Engine 2.0 for Windows in one installation package which can be downloaded at – https://www.citrix.com/downloads/citrix-receiver/additional-client-software/hdx-realtime-media-engine-20.html. 4. If you are going to be your testing from a thin client instead of a laptop, netbook or workstation then ensure that you review the latest Citrix Ready classification for Thin clients avaiable at – https://citrixready.citrix.com/info/thin-clients.html however I would recommend that you review the Thin Client whitepaper first and focus on page 4 which you can download and view at – https://citrixready.citrix.com/content/dam/ready/assets/thin-clients/thin-clients-features.pdf. If your looking for Skype for Business compatible hardware please ref to – http://partnersolutions.skypeforbusiness.com/solutionscatalog#/locale=en-us&categoryid=2&sortby=3&subcategoryid=3,5&filter=&manufacture=&version=&isQualified=&region=&language=&page=1&apptype=&tags=. 5. If your intending to deploy a test/poc Skype for Business 2015 environment then be sure to check out these technical diagrams avaiable at – https://technet.microsoft.com/en-us/library/dn594589.aspx which contains some great diagrams depicting traffic flows and ensuring Call Quality Methodology (CQM). 6. Skype for Business and Lync Delivery Feature Matrix – http://support.citrix.com/article/CTX200279. 7. Finding a suitable HDX Ready thin client please check out – https://citrixready.citrix.com/content/dam/ready/assets/thin-clients/thin-clients-features.pdf of use any smart device that supports Receiver with the RTME for Windows, Linux & Mac. 0. Initiate a video call using Skype for Business from your PC using Skype for Business as a published virtual app on its own or in a virtual desktop between yourself and another individual with Skype4B installed locally on their PC or Mac. Open task manager locally and on the XenApp server or virtual desktop and watch the CPU, memory and bandwidth consumption during your video call and remember to adjust screen size during the call between small, medium and full screen. 1. Install Skype for Business 2015 client within your virtual desktop (*server or desktop Windows OS). 2. 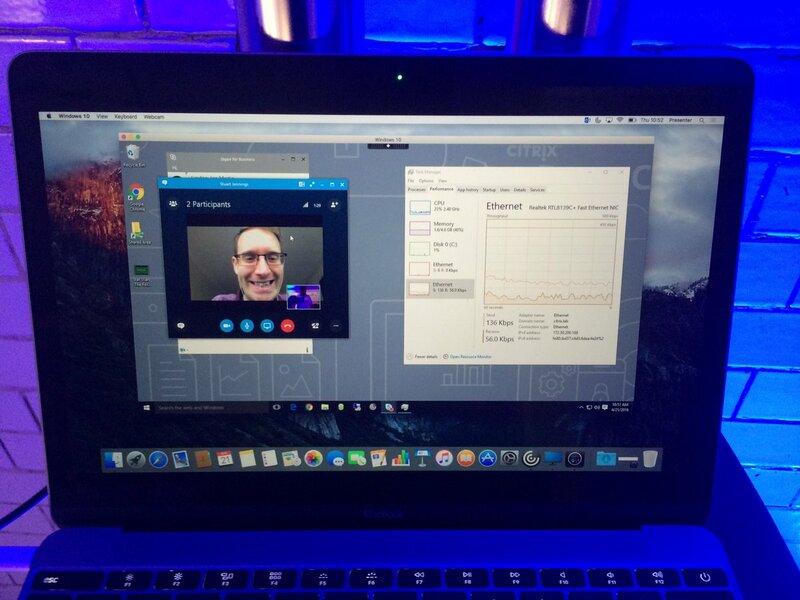 Publish the Skype4B 2015 virtual app or the virtual desktop that contains app. 3. Connect to the virtual app or desktop and verify that you can open and login to your Skype4B and ensure that its functioning as normal obviously it’s not optimized but will still perform video/audio calls thanks to the HDX technologies. 4. Close Skype4B 2015 and now install the HDX RealTime Connector e.g HDX_RealTime_Connector_2.0_for_Skype_For_Business.msi downloaded from Citrix.com. 5. Disconnect from the virtual desktop*. 7 Next install the HDX RealTime media engine HDX_RealTime_MediaEngine_2.0_for_Windows.msi downloaded from Citrix.com. 8. Start Citrix Receiver and reconnect to your published virtual Skype4B app or virtual desktop with Skype for Business 2015 installed and you should see the HDX RealTime Connector stating “Optimised. 9. Re-initiate your video call to the same user as in step 1 above and you’ll notice the difference immediately as the video will be crisp and sharp and again open task manager and repeat the same process and you’ll see the CPU, memory and bandwidth are low on the back-end but locally on your end-point the CPU, Memory and bandwidth increases to medium as the audio and video is now been processed locally on your end-point thanks to the RTME. Follow the all the steps above BUT for use with the Skype for Business 2016 you need to use the “Click-to-Run” installer and adjust the configuration.xml file for the installation to use “current” switch for the default installation behavior as Office 365 ProPlus default installation behaviour is to use “Deferred for Office 365 ProPlus. To learn how-to reconfigure the XML file in greater detail please refer to – https://technet.microsoft.com/en-us/library/jj219426.aspx for help. The min supported Microsoft Skype for Business 2016 version is 16.0.7341.2032 or later for HDX Opt Pack 2.1 ref http://docs.citrix.com/en-us/hdx-optimization/2-1/hdx-realtime-optimization-pack-system-requirements.html using the O365 “Click-to-Run” installer, for an overview of the Click-to-Run method of Office 365 please refer to the following Technet article at – https://technet.microsoft.com/en-gb/library/jj219427.aspx. The following picture depicts a Skype for Business 2015 video call HDX Offloaded using the HDX Optimization Pack 2.x.n between two Windows 10 virtual desktops hosted in different locations in the EU delivered to myself and a Citrite colleague in different locations within London. I myself was at partners customer event in the City using public Wi-fi that 200+ other people were connected to and using, he was at home in SW London connected to the internet over his home internet connection. In the unlikely event the RTME fails you want a fallback scenario to preserve the UX as best you can so could implement “Selective use of a video codec (H.264) to compress graphics” – http://docs.citrix.com/en-us/xenapp-and-xendesktop/7-11/whats-new.html#par_anchortitle_59c9 by applying the following HDX policy “Use video codec for compression” with the following setting applied “For actively changing regions“. You can find out more about this NEW graphics mode in XenApp, XenDesktop 7.11 (Seven11) at – http://docs.citrix.com/en-us/xenapp-and-xendesktop/7-11/policies/reference/ica-policy-settings/graphics-policy-settings.html and scroll to or search for the web page for “Allows use of a video codec (H.264) to compress graphics“. 1. Check the obvious ACL’s of your f/w(s) – http://docs.citrix.com/en-us/hdx-optimization/2-1/hdx-realtime-optimization-pack-configure-firewall.html and remember that external Lync/Skype for Business users connect to the Skyp4B/Lync Edge server which is critical component of Skype for Business/Lync Server infrastructure. 2. Resolving poor quaility video, sound issues, collection thin client logs for Dell Wyse terminals and much more – http://docs.citrix.com/en-us/hdx-optimization/2-1/hdx-realtime-optimization-pack-troubleshooting.html. I’d suggest watching the following broadcast on YouTube entitled “SfB Video Broadcast: Ep 9. VDI” from the Skype for Business team providing a Microsoft perspective on the offloading capabilities for Skype4B with the Citrix Optimisation Pack 2.0. As a final thought discovery more about Skype4B at there YouTube channel which is accessiable at https://www.youtube.com/channel/UCfL-WUXlvFjLsUs4UCpPrsA. This entry was posted in Citrix, Citrix Receiver, Data Centre, HDX, HDX Broadcast, HDX Realtime, Lync, Microsoft, Skype for Business, Skype4B, XenApp, XenDesktop and tagged Deploying Skype for Business 2015 on XenApp 7.x, Deploying Skype for Business 2015 on XenDesktop 7.x, Deploying Skype4B on XenApp 7.x, HDX Realtime, HDX RealTime Connector, HDX RealTime Media Engine, HDX RealTime Optimization Pack 2.0, Lync 2013, Office 365, Setup Skype for Business XenApp, Setup Skype for Business XenDesktop, Skype for Business, Skype for Business 2015, Skype for Business 2016, Skype4B, Version 1608 (Build 7341.2032), Virtualize Skype for Business, Virtualize Skype4B on April 25, 2016 by lyndonjonmartin.